Guiding Scouts on a voyage of challenge, adventure, and achievement. Scouts reconnoiter, explore, discover, observe, experience, evaluate, venture and pioneer. We do not follow an easy road of soften the hard corners. Scouts revel in physical, mental and spiritual challenges. Scouting is an adventurous, transformative, and joyously impractical journey. Scouts find joy in things some would call impractical. What Practical person would voluntarily leave the hard-won comforts of home to traipse through the forest and sleep on the ground? What adult in their right mind would devote their free time working in the intensity and chaos of group of Scouts? Millions of adults all over the world volunteer as Scouters. When we volunteer our time to Scouting, we join a worldwide movement that simply, yet profoundly, asserts we can get along with each other if we try, we can make the world a better place. We make Scouting possible when we turn the key on the meeting room door, or drive a carload of Scouts to their next adventure. Scouting’s continued relevance hinges on the attitude of each individual Scouter. We are good, practical people concerned about the next meeting or camping trip. We have plenty of forms to fill in, records to maintain, and plans to develop. less tangible elements of Scouting at the heart of the movement. I have shared a thousand campfires, camped many nights, hiked, and canoed many miles; I’ve grown older—perhaps even wiser—in the company of Scouts and Scouters. As we covered literal trails through the wilderness, my Scouts were travelling the figurative trail toward adulthood. I have seen Scouting’s tremendous transformative potential at work, I know the trail, and here’s your map — so let’s get going! It’s up to you to take the first step! Great straight forward guide for adult Scouters whether its your first time as a leader or those of us who have many years in Scouting . Though not an “official publication” of the BSA, it should be! 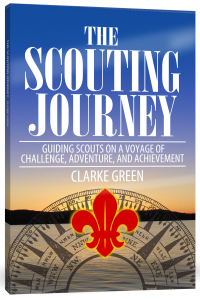 While the materials is mostly familiar to long-time listeners to Clarke Green’s podcast or readers of his blog, this book is a great resource for Boy Scout leaders who want to make sure their Scouts are getting the most out of the Scouting program. It serves as a great summation of all the great work he’s done on his long-running podcast (over 200 episodes as of this writing) and blog posts. Leaders who want to implement the Boy Scout program well and run a boy-led troop will find no better resource than this book (along with the podcast and blog, though the book is complete on its own). Clarke’s writing is conversational and entertaining, making the book a pleasure to read. This is essential reading for any Boy Scout leader. In 1919, the founder of the Scouting movement, Robert Baden-Powell, published his vision of Scouting in a booklet titled Aids to Scoutmastership. Translated into many languages, often quoted, and frequently republished, this brief, unassuming little booklet remains a valuable link to the ideas that form the foundations of the Scouting movement. Unfortunately, Baden-Powell’s century-old turns of phrase cloud these ideas for many modern readers. The Scouting Journey is a sincere attempt to faithfully update Baden-Powell’s vision for the present generation of Scouters. Like Aids to Scoutmastership, the result is not a systematic how-to guide; but a statement of the broad underlying concepts, the basic framework, of Scouting. My aim is creating a map to guide new Scouters as they begin their journey, and inspiring veteran Scouters to travel though familiar country with a fresh set of eyes. Naturally we Scouters are intent on helping the next generation form positive values—but Scouting is not just a hedge against the perilous future. It is a transformative journey following a guiding star: the Scout oath and law—a simple statement of virtues and obligations that have defined stable, enlightened societies throughout human history. Scouting is not a group of young people staging a continuous, historic re-enactment of the first Brownsea Island encampment. Today’s Scouts preserve relevant traditions, but Scouting remains as dynamic and engaging as it was a century ago. Scouts aren’t tourists; they are explorers committed to a journey of discovery, one step at a time, and one trail leading to the next, always moving forward. Do you remember what it was like to be a child, how you yearned to grow up? Scouting is a framework that lends this yearning direction and structure. Why not you? Perhaps you doubt you are ideally suited to be Scouter, know enough to lead Scouts, or if the effort is worth your time. Every Scouter I have known has had to overcome those doubts so you are in good company! Most of us volunteer as Scouters because our children are Scouts. I have never known a parent to regret spending time with their child as a Scouter. Some may regret they had not spent a great deal more. Scouting needs folks who are willing to get going and keep going more than it needs experts or heroes. Just reading about the territory explained in this book isn’t enough; you have to travel there to know the place. I can point out landmarks, and share the skills I’ve learned to travel well, but to become experienced yourself you have to get going and keep on going. Every Scouter needs to understand our common goal and the methods we employ to reach that goal. Scouting organizations apply the general philosophy of the Scouting in specific policies, procedures, and activities. These specifics define a program, and that program is our map. It’s not my intention to describe the details of a single Scouting organization’s programs, let alone those of all the various worldwide organizations. Each has their own specific way of doing things but all share common methods aimed at a common goal. Good Scouters prioritize everything they do against achieving the main aim. Everything worth doing has to do with our Scout’s progress. If we find what we are aren’t travelling toward the main aim we stop, and get back on track! Scouting shares similarities with other youth activities, but no other program is exactly like it. Once we know where we are headed and the landscape we are passing through, it’s time to look at exactly how we travel. Our journey is an adventurous ramble, a pilgrimage, whose greatest joy is in the trip itself. The methods of Scouting set our pace. We aren’t flying over the territory; we are traipsing through it, taking in all the voyage has to offer. All Scouters ought to strive to better know their Scouts, the Scouts’ families, and fellow Scouters. The experiences and relationships change both us and the Scouts and Scouters we are working with. One minute a Scouter may be a coach, the next an instructor, a little later a counselor, manager, leader, or trainer. The common thread woven into all these roles is the spirit of a helpful guide. Scouters apply the patrol system, reflection, guided discovery, inspiration, mentoring, and advancement to guide Scouts of any age. These techniques are the Scouters “virtual Swiss army knife. Scouts want to do exciting and engaging things, not just repetitive activities aimed at getting the next badge. Scouters are guides in this system of play and challenge. We are not academic educators working our way through a curriculum or delivering lectures and grading tests. Scouting is, first and foremost, for the Scouts; something they do for themselves rather than a program of activities presented for them. Scouts should be engaged in leading one another, in making decisions affecting what they do and how it is done. … our ideal responsive leadership role as a barely perceptible influence empowering young people to do things for themselves. We accomplish this in a progressive partnership: adult and youth roles are collaborative, not hierarchical. This partnership is one of the unique facets of Scouting that adults often misunderstand. Baden-Powell chose the word “Scouting” to invoke “the work and attributes of backwoodsmen, explorers, hunters, seamen, airmen, pioneers and frontiersmen.” Adventure in the great outdoors is elemental to our success; Scouts strive to find our place in and form a living connection with the natural environment. Scouting’s positive, constructive, methods effectively prevent most bad behavior by encouraging good behavior. If difficulties arise, we apply constructive discipline. This is not to say we tolerate bad behavior. Our expectations are nothing less than those virtues defined in the Scout Oath and Law. There are two poisonous snakes native to the area where I live: the timber rattler and the copperhead. After 40 or so years spent in the outdoors, I can count the times I have run across these snakes on one hand. I know how to identify both, how to avoid them, and what to do if they bite. It is likely you have about the same chance of encountering the things in this chapter as I have of running across a copperhead or a timber rattler. Nevertheless, every responsible Scouter needs to know how to identify them and what to do if you encounter them. Boys or girls learn there is a thing called “Scouting,” tell their parents they want to be a Scout, and appear at the doorway of our meeting room. I’ve hung in there long enough to enjoy watching some of my old Scouts grow up and journey far into adulthood. Scouts from my first few years as a Scouter are now approaching 40 years of age (!) and have families of their own; it seems like an impossibly short time has passed since we were all camping together. I am still out camping with my young Scouts watching them pass through familiar experiences; the first camping trip, the first week away from home, the year they seemed to grow an inch every month, watching as they discover greater confidence and skill. It’s been a wonderful journey, and so much more lies ahead!